1. 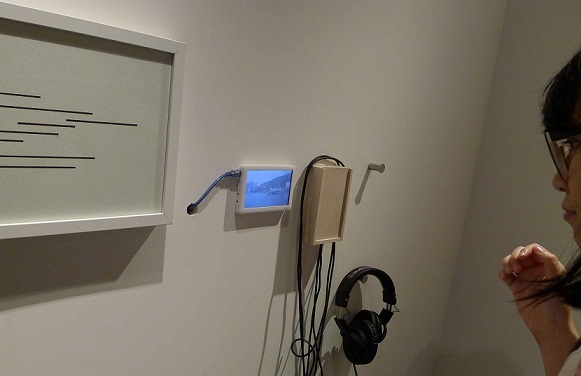 Eddie Ladoire, Intimity 4, 2015, sound piece, 20 mins, Commissioned by the CNAP, Centre National des Arts Plastiques, Paris. Visitors listening to Ladoire's sound piece while walking around the exhibition. 2. Pierre Bastien, Paper Orchestra, 2003-2013, paper and blowers. 3. 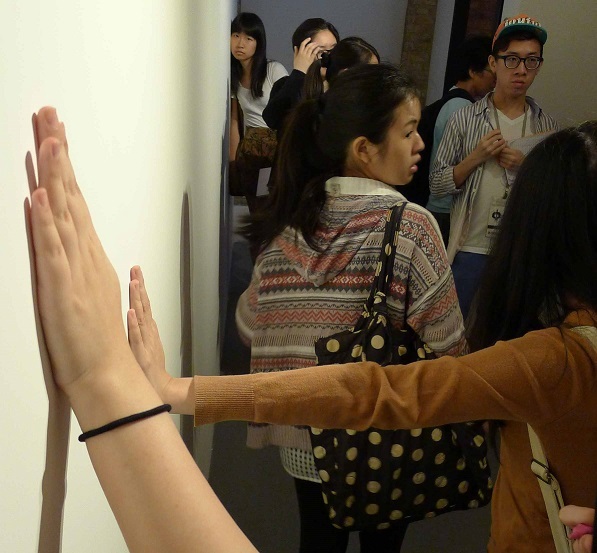 Edwin Lo, Seawall, 2013, sound installation. 4. Pierre Jean Giroux, Invisible Cities (Shrinking Cities-Part III), 2015, video. 5. Pierre Laurent Cassiere, TACT2, sound Installation, TBF generator, amplifiers, low frequency transducers. Commissioned by the CNAP, Centre National des Arts Plastiques. Audiences continue attending the concert hall, cinema and watching family television, but choices of media are expanding while fixed-location cultural venues must be innovative with programming strategies. It is ironic this exhibition is housed at Comic Home Base, a recent outpost of the Hong Kong Arts Centre located in a heritage Wan Chai tong lau. It was to be a dedicated venue for comics and animation related presentations, but this narrow remit and the building’s limitations have necessitated the featuring of exhibitions in a wider variety of media. 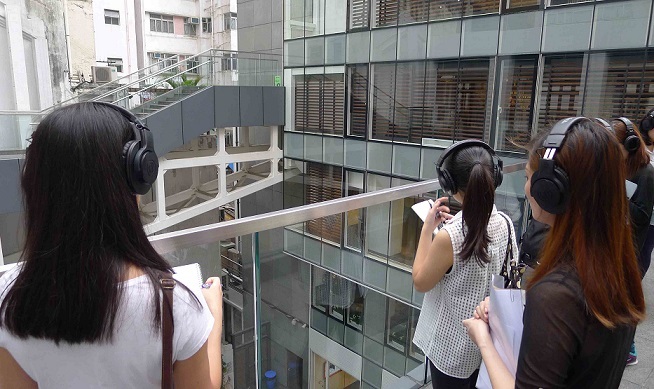 Beyond the Sound has “…the listening experience” or ‘sound art’ at the exhibition’s “core,” but each artwork by the participating French and Hong Kong artists is also beautifully visual, whether of itself or as part of the surrounding architecture. The exhibition is also complemented by a symposium and a separate performance of participating artist Rainier Lericolais’ Concert Quator #4 performed by The Hong Kong New Music Ensemble. Eddie Ladoire’s Intimity 4 is a recording of snatched sounds and conversations from around Hong Kong, then “electroacoustically” composed. Participants are given headphones to listen while walking around: the result is an ethereal experience. 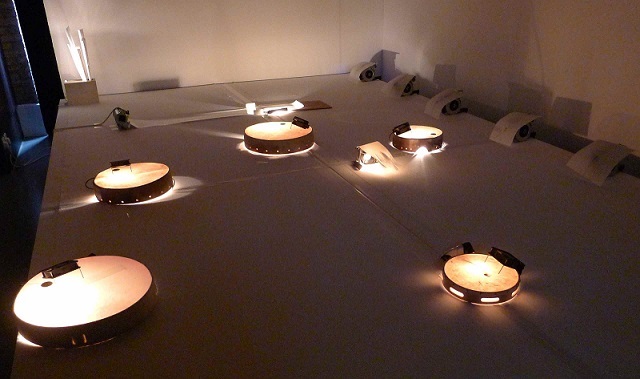 Pierre Bastien’s kinetic Paper Orchestra features automated drums, flutes and organs constructed from paper that whirl, flutter and rhythmically perform a Bastien composition aligned with atmospheric lighting. 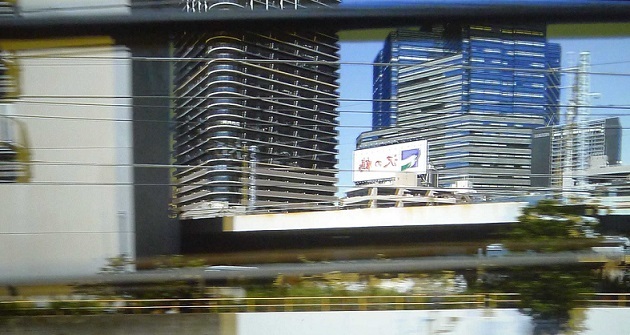 In contrast Pierre Jean Giloux’s Invisible Cities (Shrinking Cities-Part III) is technically challenging: a filmed tracking shot of a train journey through Tokyo’s suburbs that expertly welds composite images, graphics and synthetic imagery into a mesmerizing video and soundtrack. Young Hong Kong artist Edwin Lo’s Seawall captures the sounds of Aberdeen Harbour, both beneath and above the sea. This is graphically recorded in a series of straight-line drawings of his sonic explorations. Similarly, Pierre Laurent Cassiere’s TACT2 is a sensory installation of low frequency transducers and amplifiers housed behind an empty white gallery wall. These produce a sound below the threshold of hearing. In a lovely twist of 'sound,’ the audience, like spiders who have no ears, must feel the wall to ‘hear’ it.